JUNCTION CITY, Kan. — A Kansas school district has decided to give representatives of Gideon International the boot after receiving a complaint from a prominent humanist organization. An attorney for Geary County Schools USD 475 in Junction City sent a letter to the American Humanist Association (AHA) on Friday to provide “assurance” that the district would no longer permit the Gideons to conduct the distribution at schools. AHA had written to Superintendent Corbin Witt and Seitz Elementary School Principal Jodi Testa on Tuesday to explain that a parent of a fourth grader at the school had contacted the organization to complain about the Bibles being made available to students on Nov. 4. According to the correspondence, teachers told students that they could leave the classroom during pack-up time at the end of the day and take a Bible if they wished. But AHA says that “[t]he Bible distribution made the student feel extremely uncomfortable; she also felt that the school was pushing religion on her.” The girl’s mother subsequently called Witt’s and Testa’s offices. AHA then asserted that the allowance of the Bible distribution at the school violates the Establishment Clause of the First Amendment, which reads, “Congress shall make no law respecting an establishment of religion or prohibiting the free exercise thereof,” and demanded that the district stop providing authorization of the group. On Friday, Mark Edwards, an attorney for the district, replied with a short notice that the Bible distributions would cease. 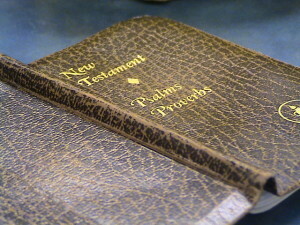 “Please consider this written assurance that [the district] will no longer facilitate the Gideons in distributing Bibles in our school district,” he wrote.